Stella is started through a little script (stella.sh) which only changes the directory to the stella-rom-directory and executes stella. So here are the files. I hope they are useful.. I created a method that works with DosBox. 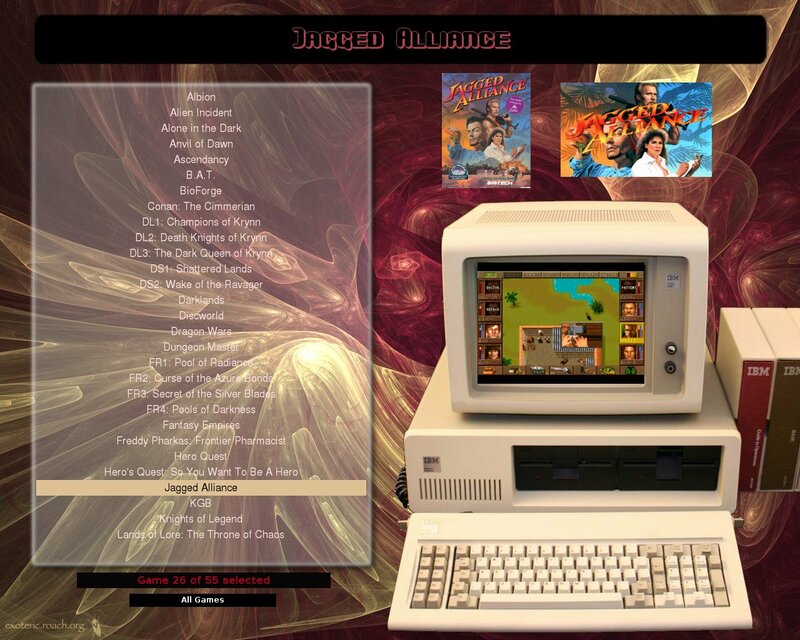 This is what my dos layout looks like. What I did is place each game into it's individual folder in a games directory, then create matching dummy roms in my roms folder, making sure the rom name and the folder name are the same. I would type out the full name since the nms feature wasn't available then, but you could use short names now if you use an nms file. Then in each game folder I would copy an existing start.bat file from the game or create a new one. I just made sure I had a start.bat and a setup.bet for my alternate command. Finally I created two dosbox configurations, one for playing the game and the other for my alternate, which is used for game setup. Most setup programs are picky about the display so I tried to keep it simple. commandline_format -fs 1 -openfl 1 "[rompath]/[name]. [romext]"
commandline_format -F --auto-frameskip --no-pause-when-inactive --no-show-speed "[rompath]/[name]. [romext]"
1) The key to quit yabause is ctrl-q, can we see a remap feature like arcadeos. commandline_format -a -f -b "/home/ktw/.yabause/bios/SEGA_100.BIN" -i "[rompath]/[name]. [romext]"
This is great making Wah!Cade easy to use with so many emulators. Now what we need to do is set up a repo that has packaged emultors that are known to work well with Wah!Cade so that users can grab from those and use Wah!Cade with fewer config issues. My preferred version of SDLMAME is from Ludomatic (see post elsewhere in this forum). Here's the .ini file for it (I called it sdlmame_ludomatic.ini). To keep my life simple, I just extended the directory structure created by the Ludomatic version of SDLMAME - everything is in /usr/share/sdlmame/ somewhere. Here is my .ini file for the Stella Atari 2600 VCS Emulator in full screen. I need to figure out how to map the keys to my ipac joystick so this might get revised in the near future. Stella uses things like ctl+Q to exit rather than just esc. Balki, please note that the Stella.ini file still says genesis.ini at the comment on the top of the code-block. I assume that this is probably reporting the wrong ini comment and version in most .ini files. Here is the PC Engine / TG 16 ini file I use. Please note that Hugo if downloaded from the current site has some compilation issues with modern compilers. It works GREAT but it woul dbe best if you wanted to get the beta version which is up to date. I see that the same issues are in Stella. Has there been any resolution to these? commandline_format -nogui -runcdbios -cdfile "[rompath]/[name]. [romext]"
And yet again, this emulator doesn't use the escape key to quit. We could really use a key remapper. Maybe if you look at xmodmap, you can get a good idea how to implement it. Here's my .ini file for Nestopia ( http://nestopia.sourceforge.net/ ) an NES emulator. Here is a code template for Hugo, the Turbo Grafx 16 Emulator.